Frost & Sullivan concluded its 9th edition of Growth Innovation & Leadership (GIL) India 2017 Summit on October 5th at ITC Maratha, Mumbai, which featured various industry luminaries, thought leaders, bureaucrats, and Frost & Sullivan industry experts. 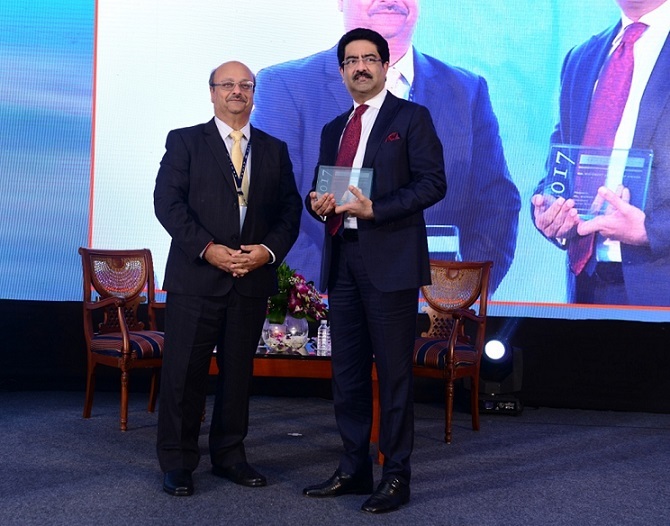 This year at the Summit, Frost & Sullivan felicitated Mr. Kumar Mangalam Birla, Chairman, Aditya Birla Group with the “2017: GIL Visionary Leadership Award” for his visionary leadership and achievements. CXOs across industries convened at Frost & Sullivan’s 9th edition of Growth Innovation & Leadership (GIL) India 2017 Summit to discuss how disruptive innovation is reshaping industries and how organizations need to digitally re-imagine their business initiatives to fulfill digital transformation mandates. The Summit held on October 05th in Mumbai presented phenomenal sessions by illustrious panelists, Frost & Sullivan industry experts, and thought-provoking insights from various industry luminaries and bureaucrats. This year Frost & Sullivan felicitated Mr. Kumar Mangalam Birla, Chairman, Aditya Birla Group with the “2017: GIL Visionary Leadership Award” for his relentless philanthropical pursuits and his determination in building one of the largest conglomerates in India. He joins an elite roster of Visionaries, Innovators and Leaders who have received this award previously, including corporate honchos such as Ratan Tata, Anu Aga, Neftaly Malatije, Archbishop Desmond Tutu, Sir Richard Branson, Mitchell Baker, and Jack Andraka. To know about GIL India 2018 or for partnership opportunities, please contact: [email protected] or visit: www.frost.com/GILIndia. You can also get updates on Twitter and LinkedIn from the hashtag: #GILIndia. The GIL India journey began with insights from Frost & Sullivan’s Global President & Managing Partner, Aroop Zutshi on technology as an enabler and as a disrupter across industries and how India is becoming a hub for innovation and growth. His session highlighted organizations aiming at an exponential growth instead of linear growth to leverage opportunities due to digitization. The Think Tank conducted by Frost & Sullivan’s Anand S, Vice President and Haritha Ramachandran, Associate Director, Digital Transformation (ICT) Practice on ‘Mapping Digital Readiness and Embracing Disruption’ assessed the digital readiness of participants both from an individual as well as an industry perspective. It shed light on findings from Frost & Sullivan's ‘Indian Enterprise Digital Readiness Index’ across top verticals. Interactive panel discussions with key decision makers and business specialists highlighted various transformational scenarios across industries. Big Data, Analytics, Connected Devices, OTT and IoT eco-systems were some of the key topics discussed by the eclectic line-up of speakers. The Summit also covered various emerging technologies like new business models, mixed reality, next-gen computing experiences, e-mobility, data monetization, to name a few. An interesting panel discussion addressing women customers and how harnessing the power of women in an economy or organization will help yield significant returns and uncover that trillion-dollar customer, was also held. Frost & Sullivan also announced the Top 3 ranking states from its Annual Growth Innovation Leadership Index for Economic Development in India, along with the Companies to Action Awards at the Summit. The Top 3 ranking states were Maharashtra, Tamil Nadu and Karnataka. Ms. Shweta Shalini, an advisor to Maharashtra’s Chief Minister, graced the occasion by receiving the award on behalf of Maharashtra State Government. She represents and heads several committees that come under the CM’s office. One of the largest is a Section 8 Company – Village Social Transformation Foundation. The foundation converges all online and offline efforts of the Government and various other corporates, NGOs and communities in Maharashtra. Harshbeena S Zaveri, Vice Chairman & Managing Director, NRB Bearings Ltd.
Priti Mohile, Co-Founder & Managing Director, MediaMedic Communications Pvt. Ltd.
Ramashankar Pandey, Managing Director, Hella India Lighting Ltd.
Santosh Datta, Head of Automotive Systems Integration (India), Robert Bosch Engineering & Business Solutions Ltd. The evening concluded with Frost & Sullivan’s 2017 India Best Practices Awards Banquet, which lauded Indian enterprises pushing the boundaries of excellence and envisioning innovation across industries. This year 57 awards were presented to a range of deserving companies across various industries such as Electronics & Appliances, Energy & Environment, Digital Media, Industrial Automation & Process Control, Metals & Minerals, Mobility, Tech Vision, and Transformational Health. To access the complete list of Frost & Sullivan’s 2017 India Best Practices Award recipients, please click here. The event was supported by: Associate Partner – Unlimit; Digital Partner – Kellton Tech; Bronze Partner – ISYX Technologies; and Media Partners – Automation Connect, Channel Times, Commercial Vehicle, Convergence Plus, CXO Today, Mtlexs, Sustainability Next, Telecom Watch, The CEO Magazine and The Smart CEO.